Today we finished another successful photo shoot for work. We've been in Toronto to shoot winter lifestyle images because you know, Toronto has lots of snow this time of year....except this year. Small problem, but not one we could not fix. 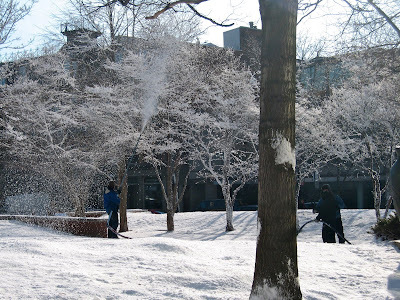 As we arrived on location, the "snow men" were hard at work making freaking snow! 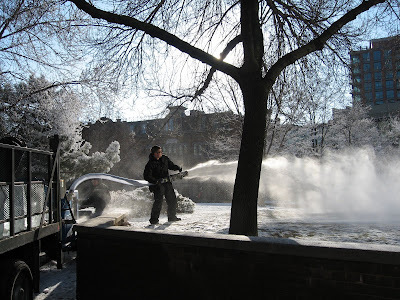 They blew some foamy stuff into the trees and shoved the largest pieces of ice I have even seen into a jumbo wood chipper type machine to blow actual snow on the rest of the park. 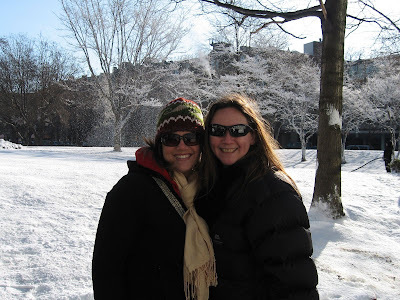 Here is Sunny and I still warm in the early morning sun in front of our fake snow. Looks pretty freaking real doesn't it. 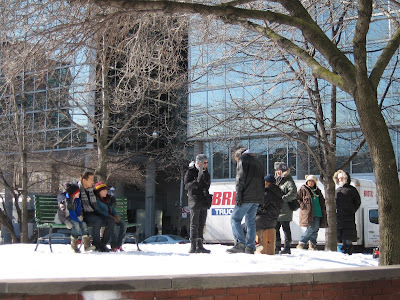 Later in the afternoon, we moved to a street location in a high traffic area and our snow making and large photo setup attracted quite a few spectators. One of them was very chatty with me (because strangers love talking to me) and could not get over the fact we were paying these "models" to just stand there and smile. He wanted to know how he could be a model and also told me I was much pretty then the girl we were shooting. You should know, the model we were shooting was Miss Russia. I almost kissed him right then and there! By the end of our 8 hour outdoor shoot we were all freezing to the bone, but this girl still managed to run 4 miles before dinner. Impressive, I know. Thankfully today's location was indoors and much more low key. Finished by 5:00 and I ran again before hitting up room service. Flying to Miami tomorrow and setting sail on my cruise Saturday. Such a rough life. I know. Nice scarf. Were you wearing pants? so fun...but you should have come to Utah. We have PLENTY of the real stuff here! Since I am reading this from bens blackberry and am dilated to an 8 I officially give you permission to go on your cruise. As long as I am no longer preg you have my full support to go enjoy yourself. Have fun! Mandy - Now why did I not think of that. Lyns - Congrats! Can't wait to meet her.